Christopher Yohmei Blasdel is an established senior shakuhachi performer and researcher and one of the few shakuhachi specialists known and highly regarded throughout Japan, the Americas, Europe, Australia and Asia. He resided in Japan for 45 years and presently lives in Honolulu, Hawai’i. Upon arrival in Japan as an undergraduate in 1972, Christopher Yohmei began studies of shakuhachi with Goro Yamaguchi; one of Japan’s highly revered Living National Treasures. He became the first of only two non-Japanese accredited by Yamaguchi with a shihan license and performing name (1983). Yohmei studied with Yamaguchi until the master’s death in 1999, and now he is one of the few performers in the shakuhachi world capable of transmitting the elegant, highly refined Kinko honkyoku techniques characterized by Yamaguchi’s performance style. Under Yamaguchi’s tutelage, Yohmei also had access to the best traditional string players in Japan, with whom he perfected his sankyoku ensemble techniques. 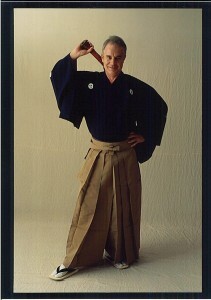 In order to better understand ensemble techniques, Christopher also studied koto, shamisen and gagaku while at Tokyo University of the Fine Arts, where he received his MFA in ethnomusicology (1982). In addition to having a strong command of the classical shakuhachi repertory, Yohmei also performs and teaches contemporary and improvisational music. He has taught courses on the performing arts of Japan at Earlham College (Indiana), International Christian University (Tokyo), Chulalongkorn University (Bangkok), Temple University (Tokyo), University of Hawai’i, and he has been guest lecturer at Seijo Gakuen University, Charles University (Prague), Texas A&M University, University of Maryland (Salisbury) and many others. Yohmei is the author of The Shakuhachi－A Manual for Learning, the foremost book on learning the shakuhachi, and also the author of The Single Tone, A Personal Journey into Shakuhachi Music, an autobiographical account of his early years in Japan studying and performing the shakuhachi. The original Japanese version of this book, Shakuhachi Odessei, Ten no iro ni Miserarete, 「尺八オデッセイ、天の音色に魅せられて」was awarded the prestigious Rennyo Award for non-fiction in 2000. Yohmei has been instrumental in organizing and running the various international Shakuhachi Festivals of the last two decades, beginning as co-director of the legendary Boulder World Shakuhachi Festival in 1998. From 2006 to 2016 he helped organize and direct the Prague shakuhachi summer festivals, and presently he is senior advisor to the World Shakuhachi Festival, scheduled for Chaozhou, China in 2022. Christopher has also released numerous CDs of contemporary and classical shakuhachi works, a list of which can be found on his website. His most recent CD is Striking Light, Striking Dark, a collaboration with vocalist Sasha Bogdonowitsch, consisting of original music set to the poetry of Rainer Maria Rilke, Pablo Neruda, John Logan, Sam Hamill and the Tang Period Zen poet Fuke Zen-ji. Christopher Yohmei’s other love is Aikido. He began training in Tokyo in 1976 under Yasuo Kobayashi. Presently a 4thdan, he continues practice and occasionally teaches Aikido in Hawai’i. He often conducts workshops applying the basic philosophy of Aikido movement to shakuhachi learning, especially in how it enables a fluid execution of bodily movement and relaxation. Blasdel is available for concerts, lectures and demostrations of traditional or contemporary Japanese music for scholastic or general audiences. Solo or ensemble performances, consisting of some of Japan’s best musicians, can also be arranged. For further information please contact Christopher Yohmei Blasdel.